Title : What Is History? This is a masterful study of the questions historians ask themselves--and readers of history should ask themselves--about the nature of the writing of history. Is history a bunch of objective facts just put down by a disinterested bean-counter called an historian? Or is it a study of the past with the goal of shedding light on the present? Is it a 'tale of the victors', as the losers in history are usually obliterated? Is it cause and effect? Is there a Spirit of History, a World Spirit a la Hegel? Carr was an eminent Russian historian and it is fascinating to get a look into the making of history, how the vision has changed from century to century… how the scarcity of facts makes the writing of history both easier and harder, the specific problems of 'contemporary history.' The issue I find especially important is the lens through which an historian assembles his or her facts for analysis--that people need to understand that it's not "I read this" ergo it's true. We need to identify the lens, and perhaps balance it with the lens of the opposite point of view, and maybe triangulate with histories by writers more or less colorful and opinionated--though opinion, or point of view, IS the engine which sends the historian on his or her journey in the first place. It's much like biblical scholarship--to understand the hands which have created a specific text, and each historian has his or her own world view and raison d'être in creating it. Which bone are they picking? Which school of historiography (the study of the writing of history) do they consciously or unconsciously take as their own? Carr, like many historians, is an absolutely fantastic writer--some of the turns of phrase, the little asides, sometimes gentlemanly digs at colleagues, are laugh out loud funny, as well as very thoughtful.I would have liked more philosophy myself… but this small book had been originally a short series of lectures, which is one of its virtues. I bought a 50¢ copy of this book years ago on a bargain bin spree at either Housing Works or the Strand. Until recently, every time I paged through it I couldn't help but deride its maddeningly simple-minded premise: in a series of lectures at Cambridge in the 1950s, Carr set out to actually answer the question what is history.Is history a science? Are there "causes" for historical events? What is fact? And, yes, this is as boring as one might expect. You advance through a few pages of this kind of freshman exegesis and you start asking "Are you serious?" over and over.Yet, and of course, Carr wins you over, oh word booty. He builds on these simple questions and lays out a truly compelling progressive theory of history. He lets you in on conversations he's been having with himself about his profession, the thing that clearly animates his entire life, and it's an honest and rare little inspiration.Plus, he gently mocks conservatives now and then. Here's a wonderful bit about the hidden cost of conservatism that made me mentally pump my fist:In ordinary life we are more often involved than we sometimes care to admit in the necessity of preferring the lesser evil, or of doing evil that good may come. In history the question is sometimes discussed under the rubric 'the cost of progress' or 'the price of revolution.' This is misleading. As Bacon says in the essay On Innovations, 'the forward retention of custom is as turbulent a thing as an innovation.' The cost of conservation falls just as heavily on the under-privileged as the cost of innovation on those who are deprived of their privileges. The thesis that the good of some justifies the sufferings of others is implicit in all government, and is just as much a conservative as a radical doctrine. Exploring the study of history31 December 2011	This book is not actually a book on history per se but rather an exploration of the discipline of history. This is the main reason that I consider it philosophy as it is not looking at a specific historical event, or looking at the history of civilisation but rather taking a step back and exploring what it is that historians do. This is something that many of us generally take foregranted when we look and an historical event. Many of us will discuss the reasons behind the event and the results of what happened from the event, but we generally do not look at what goes into our thought patterns when we discuss these things. This, though, I believe is important because by understanding the background to the discipline helps us interpret the events and come to better conclusions as to the events that we are looking at. There are a few things that I wish to outline with regards to Carr's philosophy (this book is actually a series of lectures that Carr delivered, and then published in book form). First of all we need to consider the context of the event. Carr indicates that history does not occur in a vacuum. Once again, we generally know and accept this, but do not really think too deeply about what it means. Carr does discuss causation, and this is an important aspect of history, but before we come to causation, we must understand the concept of a fact in history. We generally understand that history is made up of facts. It was a fact that Rome dominated the Mediterranean region during the late classical period, just as it is a fact that Hitler invaded Poland. These are things that we generally do not dispute, but the question that is raised is how we come about those facts. In the case of Hitler there are a lot of sources that we can turn to to confirm this fact and also assist us in making sure that the event of him invading Poland is a clear as possible. In a recent event this is easy, however when we are looking back at events that occurred in Ancient Rome, then our sources are much more limited. For instance, there are only two sources that deal with Hannibul's invasion of the Italian Peninsula, and both of these sources were written by Romans at least a hundred years after the events. As such the telling of this tale is clouded by the opinions of the writers and the societies in which these writers were writing. Then we have sources such as Plutarch, who wrote even later, and wrote from a number of sources. However, Plutarch's telling of the story is going to be coloured by the sources that he chose, and the selections that he took from his sources. Plutarch has a purpose in writing his history, and his use of sources are going to be coloured by his own thoughts and opinions. As can be seen, the sources that we rely on to obtain facts will be coloured by the writer and the society in which that writer was writing. However there is be a further twist to this in that our interpretation of these sources are going to be further coloured not only by the society in which we live, but also since many of the sources, at least for the ancient world, are not written in our language, we must also go through the process of either interpreting the documents ourselves, or relying upon somebody else's translation. This is probably why Carr indicated that any historian that is worth their salt should be able to read and understand at least one other language (mine are Ancient Greek and German). As mentioned our context is going to colour the way we interpret history, particularly when it comes to the concept of cause and effect. In the Early Modern Era, historical movements and changes were seen as the actions of single men. Therefore an event would occur because a single person chose a course of action and pursued it. Take for instance Hannibul's invasion of Italy. Earlier Carthage and Rome had gone to war over possession of the island of Sicily, and Carthage had lost the war. As a result, Carthage was forced to hand over colonies and pay tribute to Rome. This had left a bitter taste in the mouths of the Carthaginians, and it was going to happen, sooner or later, that one person was going to want revenge, and that person turned out to be Hannibul. However, as society changed, we came to understand the causes of events differently, particularly as the French Revolution rocked the continent. There was no specific person that could be seen as starting the French Revolution, but rather it was a general social movement that precipitated the event, and these ideas had filtered into the French Nation due to their participation in the American War of Independence. This explanation can also be used with regards to Hannibal. First of all, causes in themselves have causes, and these causes also have causes. As indicated above, it was the Cartheginian defeat in the first Punic War that resulted in Hannibul arising, however, the social movement theory suggests that if it was not Hannibul, it would have been somebody else. Further, it was a social event that brought about the first Punic War: two empires that were growing were bound to come into conflict with each other, and the defeat in the war did not just effect one person, but a whole range of people. In a strange way, history repeated itself in the first half of the 20th century. However, come the late 19th Century, the concept of causes changed again and now many of us look at economic causes as being the reason behind many historical events. With the French revolution is was the fact that the French Government was bankrupt and attempted to increase an already crippling tax rate upon the commoners that was the spark that resulted in the French Revolution. In the same way the first Punic War could be considered a trade war as Rome and Carthage came to blows over trade routes and colonies, in particular Sicily (which was the staging ground for much of the first war). However, this is not purely economic as also strategic for whoever gained control of Sicily would have the upper hand, which suggests that it arose out of a clash of Empires. I don't necessarily agree entirely with Carr's exposition of history, but that is because we tend to approach history from different angles. I tend to had a teleological view of history, meaning that history moves from a beginning to an end and history is relentlessly moving towards that end, even though we may only have a vague understanding of what that end will be and when it will occur. This has come out of my Christian upbringing. Also there is the debate over divine intervention. Carr does not accept this, however I do, though will admit that it is subtle at best. This comes out in the doctrine of accident in history. Some suggest that there is no such thing as an accident, but I say rubbish. It was an accident that enabled the Americans to defeat the Japanese at the battle of Midway (where it was Hitler's insanity that resulted in him invading Russia). The further back in history we go, the more distinct the causes, the turning points, and indeed the accidents, become. Take for instance the defeat of Senaccerib at the gates of Jerusalem. The Bible (one of our sources) says that at night the Angel of Death came down and slaughtered the Assyrian army. Modern historians suggest that it was a disease. Either way, my position is that this single, accidental (or divine) event pretty much changed the course of history. I mentioned above that if Hannibul didn't rise up, somebody else would have. While that may be true, it was Hannibul, with all of his strengths and his weaknesses, that rose up. It was Hannibul that came up with the plan to march over the Alps, and the tactics he used to defeat the Romans at Cannae. Even though the Romans were defeated, it was Hannibul that hesitated for too long when deciding his next move that resulted in Scipio Africanus being able to launch a counter attack against Carthage. Further, it was Hitler who decided to attack Russia instead of Turkey, and it was also Hitler who decided to change course and move away from Moscow and instead attack Stalingrad. It was these characters, with their specific decisions and flaws that resulted in the history as we know it, and it is my position that it was God who raised these people up (or arranging other accidents) to set the course of history as it happens. Obviously this then raises the question of free will verses determination. Do we have free will, or are we just prisoners of a relentless history that moves forward. While I may have argued on determinism above, we have to remember that it was the choices that people made, and their desire to see through to the end their plans, that turned history the way it went. While God may have raised up Hannibul to attack Rome, it was Hannibul's choice to do something about the defeat his people had suffered, just as it was Hannibul's choice not to march on Rome after defeating the Romans at Cannae. In the same vein, it was Hitler's choice to invade Soviet Russia instead on Turkey (the reason I use that is that if he had invaded Turkey, he could have then moved into the Fertile Crescent and captured the oil fields of the Middle East rather than wasting his resources in a fruitless campaign against Russia). In the same sense (though this is controversial in and of itself) it was Franklin Delanore Roosevelt's decision not to act against the Japanese Fleet that turned the war in the Allies' favour, just as it was the Japanese's leadership's decision to attempt to take out the American Pacific Fleet to attempt to prevent them from entering the war. This is a short book, and while I would suggest that we don't need to agree with everything Carr writes in his book, I believe this is a good book for the serious student of history. Carr assists us in understanding the discipline and also the controversies that arise in the way we interpret it: do we look at single people, accidents, social movements, or economic forces. Carr suggests, and I agree, that we must look at all of these factors, as all of these factors, particularly when we are looking at modern events (such as World War II, which ironically Carr does not even mention) in trying to understand the context, the reasons behind, and the effects, of these events. Objective RealityLet me begin by stating my personal objectivist viewpoint: There is only one single objective reality. Either some event in the past happened, or it did not. Someone’s opinion does not change that fact. For example, on January 10, 49 BC Julius Caesar crossed the Rubicon River with some of his soldiers. Or he did not. There is only one correct answer.The Hard Truth about Historical FactsSo is the job of the historian is simply to collect up all the objective facts, and an accurate account of what actually happened will automatically follow? Carr points out a few problems with this Positivist view.First, we cannot directly observe anything that happened in the past. We rely on the accounts of other people, who may in turn be relying on accounts of yet others. The Rubicon story may have come from some propagandist putting a spin on Caesar’s overthrow of the Roman Republic. The historian must assess the accuracy of each so-called fact. That requires judgment. And there are too many historical facts. For example, millions of people have crossed the Rubicon. Exactly what makes Julius Caesar’s crossing worth mentioning.Carr tells us, "The main work of the historian is not to record, but to evaluate; for, if he does not evaluate, how can he know what is worth recording?" One can only evaluate on the basis of one’s own experience, which occurs during the historian’s lifetime. Thus the historian is the product of history before he begins to write it. History consists essentially in seeing the past through the eyes of the present. There simply cannot be a complete separation between subject and object, between the historian and his perception of the past.All this sounds dangerously like subjectivism, but it is only an objective acknowledgment of the difficulties in reconstructing what actually occurred in history. In his words,“The historian and the facts of history are necessary to one another. The historian without his facts is rootless and futile; the facts without their historian are dead and meaningless. My first answer therefore to the question ‘What is history?’ is that it is a continuous process of interaction between the historian and his facts, an unending dialogue between the present and the past.”First Study Your Historian"When we take up a work of history, our first concern should be not with the facts that it contains but with the historian who wrote it. Before you study the historian, study his historical and social environment.”This is the take-home message of the book. Carr gives many examples of how historians interpret the same period of history differently, and how those interpretations are influenced by the experience of their own time. He gives examples of the same historian writing different historical accounts depending on the social changes occurring over his lifetime. He goes so far as to say that one can interpret the social context of the historian by the way he writes his history of the Roman Empire. Caesar’s triumph may seem glorious to one benefiting from stable autocratic rule, and less glorious to one experiencing the oppression of a ruthless tyrant. The historical account is written accordingly.The Lessons of HistoryWhy do we study history in the first place? It is more than just raw material for literature. We are looking for a guide to understand the present, and seek insight into the future. Carr dismisses those who claim there can be no lessons from history. Yes, there are contingent events and strong personalities. But there are also underlying forces that are still operating today. He personally participated in the 1919 Paris Conference and says everyone in the delegation believed that we could learn from the lessons of the Vienna Congress, the last great European peace congress a hundred years earlier.But he cautions that the lessons of history should not be taken too literally. He tells us. "The Bolsheviks knew that the French revolution had ended in a Napoleon, and feared that their own revolution might end in the same way. They therefore mistrusted Trotsky, who among their leaders looked most like a Napoleon, and trusted Stalin, who looked least like a Napoleon." The new lesson of history here is that there are worse things than a Napoleon.History as a ScienceCarr claims history is a science, and I have to agree that at least it should be. He points out that history and the physical sciences are not as different as they appear to be. Physics is not simply a collection of facts, as the theories to explain those facts are what bring it to life. The mathematics may be exact, but the interpretation to make it verbally comprehensible is a subjective exercise similar to that of the historian. And science itself is becoming more historical. Newton’s cosmology was about discovering the eternal laws that govern the universe. But geology and evolutionary theory are about discovering the events of the past to explain where we come from. Astronomy has moved from observing the fixed heavens to discovering how the universe came to be what it is.It is worth remembering that evolutionary theory was interpreted as “survival of the fittest”, which corresponded to the emerging capitalist economy of the time. Modern interpretations pay more attention to cooperation and symbiosis. None of this takes away from the value of science. We just have to be even more careful of subjective interpretations when evaluating history.Evaluating This HistorianFor someone who describes the problems of history so well, it is interesting that his specialty is the Soviet Union, which was more a study of current events. As for his insight, this is a guy who was sympathetic to both Hitler and Stalin in the 1930’s. The last chapter shows his views have not changed much, as he defends the collectivisation of the peasants as a part of the cost of industrialisation.But perhaps his sympathy for Soviet Russia gives him a better understanding of what happened there and why, and makes for a better history. We just have to remember to take the context of the historian into account when we try to decode what he writes. For that, we can thank him for his excellent advice. Excerpt from my essay:Carr quickly discredits the notion of history as a universal entity, lambasting Acton’s proposal of an “ultimate history” by indicating that such a concept imposes a complete separation between subject and object. The 19th century positivist claim that history is a pure science is a false conviction based not on reality but rather, as Carr calls it, a “cult of facts.” Factuality comprises merely one aspect of the historian’s task. To have meaning, facts must be properly analyzed and assembled by an individual, thereby adding an element of subjectivity to any historical finding. Data may be lost or incomplete; one historian’s rationale may differ from another’s; the causes of any particular event may not have been inevitable. In order to be scientific, history would necessarily need to possess postulates which apply universally and can be re-applied with the same results. Since no historical trend can be re-applied to produce exact results, we cannot ignore that there are other complicit factors in its make-up. I am now 47 years, and I read this one when I was 20. It was in my first university (or college, if you are American) and its reading marked me deeply. It came with the emotion of the first really serious studying book. And it made me think a lot about the degree I was about to initiate. In a word, one of the books of my life. Although he penned an immense collection of writings on the Soviet Union and international relations, most historians outside of his speciality know E. H. Carr as the author of What is History?, a historiographical work that challenged the traditional mindset of the field of history. Organized as a transcript of a series of lectures he gave on the subject, Carr attempts to answer the work’s eponymous question by examining trends, and several key scholars, over the field’s development and rejecting them in favor of what he considers a more balanced approach to the study of history.In posing the question, Carr argues that any answer one gives will reflect the context of the time and society in which they live. He begins his study in the 1830s when, in a reaction to the “moralizing history” of the past, historians entered an era that he terms the “common-sense view of history” or “cult of facts”, wherein the objective of history was to collect as many “facts” as possible and then provide an interpretation of those facts, which are assumed to “speak for themselves”. With an emphasis on the importance of the “facts”, Carr sees the 19th century method as producing an overabundance of data at the cost of exploring the meaning behind it. The “fetishism” of documents that results from this philosophy also ignores the biases that these documents hold. Things change in the 20th century when historians began to realize that a focus on the “facts” of history ignores the reality that these “facts” are chosen by the historian and are thus a subjective matter of interpretation in and of themselves; the historian, especially the modern one, is able to pick among an endless series of “facts” or “happenings” and, by choosing and writing about them, builds their worth as “historical facts”. History transforms from “discovering the facts and seeing what they have to say” into a way of seeing the past through the lens of the present and attempting to re-enact the phenomena in question. With the historian and their background (rather than the facts) now playing a crucial role, Carr’s first answer to “what is history” is that history “is a continuous process of interaction between the historian and his facts, an unending dialogue between the present and the past.” In other words, Carr sees history as a dynamic process, one where facts have little intrinsic meaning and are shaped by those who study them.In his second chapter, Carr focuses on the idea that the individual and their society are inseparable, again arguing against the “common-sense” view of history, which posited that history was “written by individuals about individuals”. Both the historian and the subject are products of their social context, and Carr reemphasizes the need to understand the standpoint from which the former wrote in order to understand the work. As for the subject, he rejects the view of history as being moved by individuals acting as individuals, seeing it as unrepresentative of the complex society that spawned them and contributed to their salience. His second answer, therefore, is that history “is a social process, in which individuals are engaged as social beings” and “the record of what one age finds worthy of note in another.” In other words, history looks at the interplay between prominent individuals and their societies and, by incorporating the context of their own age, helps historians and readers understand their present (and, perhaps, future) through the past.After arguing for the inclusion of history as a science in the third chapter, Carr segues into the topic of causation in history in chapter four, where he posits another answer to the “what is history” question, arguing that “[t]he study of history is the study of causes”. It is the duty of the historian to determine the numerous causes that led to a particular event and then organize them by importance, a contradictory approach that forces one to simplify at the same they diversify. After arguing against “causeless” and “accidental” events, he posits that one studies causes because they lead to the establishment of general trends, which are important when they can be applied elsewhere. In Carr’s view, those who study chance and accident are missing the point of history, which (as stated earlier) is not merely to establish “what happened”, but to help us understand our present and future through the past, something only possible by looking at the general rather than the unique.Carr’s last two chapters explore the notions of progress and objectivity in history, and how they evolved, most notably arguing against the trend of historians to place moral judgments in their work, particularly those based on the values of their own era. Continuing his theme of the interplay of society and the individual, Carr also argues that, if any judgment is to be made at all, it should be on institutions and not only specific people, and that one should take a broad view of what each historical process led to. He ends by suggesting that historians look outside of Western Europe and the English-speaking world and claims that the historian should think of change not as something to be feared, but as an achievement.Over half a century after its initial publication, What is history? is still widely read due to its succinct summary of the discipline, the controversy it engendered, and the lasting impact it had on the field. Although its arguments should be intuitive to most modern historians, it is necessary (although, due to its age, not sufficient) reading for anyone involved with pursuit of history as an academic endeavour. There are certainly criticisms that can be levied against it (for example I think that his emphasis on studying only the “winners” of history tends to lead to an incomplete historical picture), but overall it paints a detailed picture of the development of the discipline and provides a solid foundation for the study of historiography. I first read What is History as part of a philosophy of history class. I believe that the course was given by Aristotle and the book was written on papyrus. I recall being less critical of it at that time in any case. I would still suggest it as a good introduction to issues in historiography. I would, however, suggest caution in taking Carr at face value. He has numerous axes to grind and theories to support. My major criticism is that he seems to have been a bit disingenuous in putting his arguments forward in regard to the historian's ability to be objective. He criticises Collingwood for being over sceptical, that historical certainty is not possible, early in the book while admitting that the historian's task is not easy. He states that there is always an interaction between the historian and his material, indeed that the historian must select what is important to history from a mass of facts. "The facts speak only when the historian calls on them: it is he who decides to which facts to give the floor, and in what order or context." At the same time, he wants to argue that a good historian will choose the correct facts and tell the true story. I have not been able to ascertain exactly how one is to distinguish a relativist who is only putting forward a historical fiction from a good historian who has the right facts and the right take on them. I think we can agree that academic dishonesty is not acceptable but I am not sure how he deals with simply getting it wrong. He seems to be quite satisfied that he is among the elect. He thus sees himself as a staunch historical objectivist in spite of having given his readers many reasons for considering history to be a relativistic undertaking. تاریخ چیست کار یکی از برجسته ترین آثار در زمینه «فهم تاریخ» است. کار در کتابش استدلال میکند تاریخ بشر مملو از وقایعی است که پیش چشم اکثریت روی داده اند، حال آن که تاریخ باید دربرگیرنده همه وقایع تا حد امکان باشد. ازاین دیدگاه کار به تفکر سیستمی در بررسی های تاریخ اشاره اجمالی می کند، هر چند به طور اخص به آن نمی پردازد. مهم ترین و جدی ترین بحث کار در «تاریخ تکرار نمی شود» و استدلال قدرتمند وی در این زمینه است .در ضمن کار به خوبی در مورد نحوه تأثیر تفکر مورخ بر تاریخ و نحوه تأثیر تاریخ بر تفکر مورخ بحث می کند.بعد از خواندن این کتاب تصمیم به خواندن کتاب درآمدی بر فلسفه تاریخ مایکل استنفورد و هم چنین کتاب ارزشمند هگل با عنوان فلسفه تاریخ گرفتم. هر چند باید کتاب هگل قبل از همه این کتاب ها خوانده می شد. Ένας μεγάλος Δάσκαλος,ένα σπουδαίο βιβλίο.Γραμμένο τη δεκαετία του '60 και όμως τόσο επίκαιρο! "Μετά τον Μαρξ & τον Φρόυντ,ο ιστορικός δεν έχει πια καμία δικαιολογία να θεωρεί τον εαυτό του αποστασιοποιημένο παρατηρητή,εκτός κοινωνίας και εκτός ιστορίας.Ζούμε τον αιώνα της αυτοσυνείδησης και ο ιστορικός μπορεί και πρέπει να ξέρει τι κάνει. "Τι άλλο να προσθέσει κανείς;!Μπορεί να μην είναι ένα πολυσέλιδο έργο,παρ'όλα αυτά διαβάζεται αργά και αρκετά προσεχτικά. I kinda of liked it. It is a bit repetitive at times, and I found myself agreeing and disagreeing with Carr though that should not matter. Thank you to Jackie Hurwitz for even reminding me of What is History? by Edward Hallett Carr. I read this book for a course on Historiography at Middlebury College in 2004. I should remark that this was the first book on the subject in the syllabus because, if I had read some of the other literature first, my impression may have been substantially less positive. In my opinion, positivism is the problem behind Carr's theory. Carr just puts too much credibility in the validity and Truth of facts.I remember one part of the book when Carr is exploring the nature of History by examining the historical event of Julius Caesar's crossing of the Rubicon. Carr does a marvelous job at showing exactly what we as historians can and cannot know about this historical narrative but this accomplishment is also his limitation. If a historian looks only at events, any interpretation is little more than literary analysis. While I am not a member of the school of thought that believes that any literary narrative - or historical narrative for that matter - is so fraught with bias, prejudice and misinformation as to be useless to the study of History, I do believe that a theory that is limited to a literary narrative is bound to be ineffective. Historians must consider the virtues of structuralism, social science, anthropology, linguistics and even a bit of post-modernism. Bear in mind that I have not read this book in 6 years and even then I did so for homework making my recollections of the author, his theories and his arguments really just what I have retained after all these years. I would recommend this book because it is an enjoyable read and introduces its reader to some incredibly heady concepts. After this introduction, the reader cannot persist in pleading ignorance i historical conversation as Historiography is a formidable tool. Yet as a toolbox of only one tool, this approach must be complemented by other historiographical theories to be functional. This is quite a challenging book, and you have to read it multiple times in order to understand all of what E.H. Carr is saying.It's still a great introduction to historiography. History is not just about learning facts, but learning about bias in the records and interpreting the importance of events in their social context. One example that he gives is that many people have crossed the Rubicon, but only Julius Caesar's crossing is considered history. Other important sections include the ideas of progress, the role of individuals vs. societies in shaping history, and what causes are significant to historians.This book has it all! If you want to see the historical significance of gingerbread salesmen being kicked to death by a mob, it's here. If you want to contemplate the importance of monkey bites, it's here too. (In the Read list and On-Hold list because I cheated and read a study guide that sums this up.Whoops. )History....What is it?It isn't the past....but in a way it is. It's just an interpretation of parts of the past that we find "significant" enough to interpret from others' words and write about in our own. Really only historians to that. (Excuse me for my bluntness. Remember I didn't read the real book. Will come back and read it later if I feel up to it).This is all about the question of: What is history?How can it be proven to the best of the ability?What is epistemological about it and it's sources? This is the third time i am reading this book.Although the title of the book seem that it might be easy to read. But it is not so. only when you have read a lot of history and philosophicial discussion of person like Hegel and other historians you can comprehend this book. So i have put this book in the shelve of to be read again and again and i hope that after many years i may be able to understand this book very well. But anyone who has read a lot of history books will surely like this book. Specially academecians, who are reading history in their course. Dry as kindlewood, but brilliant book that provides much food for thought. Not only relevant for the historian, but also a book that ought to be read by anyone wanting to express views about politics without sounding like an utter fool. Lightyears ahead of it's time it is a scathing condemnation of people wanting to make "Country X great again" and those who think that change is inheritently dangerous. In short this book is a steeltipped boot firmly planted in the nuts of middle-aged and elderly white men who yearn back to the time before they were shoved off the center stage. Highly recommended if you can get through the dry and academic tone! Believe it or not, this book is a best seller. To date, it has sold nearly one quarter of a million copies. 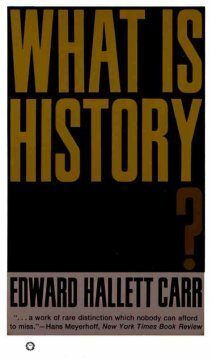 ‘What is History?’ is over 50 years old and is still indispensable reading for historians, history students and anyone with more than a passing interest in history. Despite his landmark history of the Soviet Union, this short work dominated E.H. Carr’s entry in ‘Fifty Key Thinkers on History’ (Marnie Hughes-Warrington, Routledge, 2000).The book is essentially the transcripts of a series of Trevelyan lectures delivered in Cambridge in 1961. The lectures were also broadcasted by the BBC and caused a storm of controversy. It addressed what E.H. Carr’s biographer Jonathan Haslam (‘The Vices of Integrity: E.H. Carr 1892 – 1982’, pub. 1999) described as “the age-old debate on the tensions between causation and chance, free will and determination, the individual and society, and subjectivity and objectivity”.If you ever thought that understanding history must be quite easy, relatively straight-forward, non-controversial and a little boring, this book is definitely for you! History, when done properly, is challenging, complicated, contentious and utterly fascinating.Haslam stresses that ‘What is History?’ should be read in the context of an “intermittent series of engagements in a war that has gone on since the forties”. The war was with Isaiah Berlin. Berlin’s ‘Historical Inevitability’ (1954) insisted that the ‘Historicism’ of Hegel and Marx were guilty of popularising a ‘determinism’ that rode roughshod over an ‘individual’s freedom of choice and the role of accident in history. Carr took a different line. As John Bellamy Foster (‘Defence of History’, pub. 1997) summarises, “although history has no single, definite, predetermined logic independent of human action and changing conditions, this is no reason to jettison the notion that everything ultimately has a cause(s); or the idea that the logic of historical inquiry involves precisely the search for those casual relationships, or determine boundaries and framing of events, which we can ascertain”.Both Berlin and Carr caricature each other’s positions for effect. Haslam argues that, ultimately, “the distance between Carr and Berlin in respect to their views of history was thus in some respects not as great as the public polemic would suggest; it was with respect to their political beliefs that the distance was undeniable and unlikely ever to be bridged”. Berlin was a liberal and a Cold War warrior. He condemned the Soviet Union – and Marxism – absolutely. Carr, on the other hand, was of the Left. He believed that “the danger is not that we shall draw a veil over the enormous blots on the record of the Revolution, over its cost in human suffering, over the crimes committed in its name. The danger is that we shall be tempted to forget altogether, and pass over in silence, its immense achievements… I know that anyone who speaks of the achievements of the revolution will at once be branded as a Stalinist. But I am not prepared to submit to this kind of moral blackmail. After all, an English historian can praise the achievements of the reign of Henry VIII without being supposed to condone the beheading of wives” (taken from ‘From Napoleon to Stalin and other essays’, pub. 1982). In respect to Marxism, Isaac Deutscher wrote, “much though Mr. Carr has absorbed from the Marxist conception of history, he does not identify himself with it and maintains a certain reserve towards it; in spite of his explicit criticisms of the British tradition, especially of its empiricist strand, he is of it, even if not quite in it” (cited in Haslam).Despite its great impact, ‘What is History?’ did not really satisfy Carr and he carried on accumulating material that he could utilise in a second venture into the philosophy of history. Unfortunately, he never got around to it. So, we will just have to make do with this stimulating and provocative polemic. Highly recommended. i know this is a good book but i just didn't have the patience/knowledge in history to fully appreciate it. but i did learn a few things, that history is not as simple/straight-forward as what i used to think. History is essentially an interplay between the subjective and objective; the past, present and future - how the past is viewed from the present, and how the present is viewed based on the past. And that historical "facts" aren't purely facts as we know them, because the historian has to select and some form of value/moral-judgment is involved. Also, an "objective" historian is not one that bases all his records on facts in a disconnected manner, but one who can rise above his society/time to view that incident. Which i do agree with, since there is inevitably a value judgment involved to determine what facts get recorded in the first place, and how to organise them etc (don't we learn all about that in law..)Perhaps one day i'll go through it again properly :) But anyone studying history or the humanities should read this! Old news to the professionals, I suppose. I tell my students all the cliches already: "History is written by the victors"; "History is a cruel joke on the living"; "History is pop culture." (That last one is from Wuhl, by the way.) But Carr apparently got the ball rolling. To him, studying history means studying the historian. To him, facts are not objective, in that they were subjectively selected and arranged by a human being, subject to all the subjectivity bestowed upon him and her. And to Carr, history must be a continuing dialogue between past and present. Key word there: dialogue. An ongoing debate. You can jump in at the present, but it's helpful to see how the thinkers got to where they got. It's why we study Anaxagoras and Gorgias, rather than jumping ahead to John Rawles. In my ideal utopian world everyone is interested in history and this book is on everybody's favorite list. In our less ideal world, this book can still be read by anyone and, for the intellectual snob trapped in all of us, there is at least one brilliant and easily quotable insight per page. I'm not sure the author had Twitter in mind when he wrote this book (it's actually a series of lectures from the 1960s) but his concise witticisms look deliberately crafted for our Soundbite Age. Just for the record, this is a compliment. A humongous one. One of the classics of modern thinking about History as a discipline. Simply put--- something every serious History major or graduate student should read...and so should anyone interested in what History as a discipline is and does. Read this for a class, but it is an extremely useful book form an outside on history and historiography! E. H. Carr’s book from 1961 helps us to understand the limitations of history and the questions with which historians (should) struggle. Unwittingly, it provides a reading guide to historical works. It may even encourage you to revisit and reassess your historical perspective – it certainly did for mine. Carr’s book comes packed with novel ideas on almost every other page (at least for the non-historian).To give one example: our view of the past is not fixed – it evolves. Depending on where society is evolving to (or where we think it is evolving to), historical perspectives shift. This is only natural – over time, societies consider different things as important. Hence the past is not cast in stone. And as a result, almost every (good) historian will necessarily contradict himself over his lifetime.Take facts. These should be indisputable, right? But even primary sources are far from infallible in providing “the facts”. Chroniclers are only human. For one thing, they have to select the facts that they choose to report to us which can never be neutral (the same pretty much applies to today’s newspapers which are assembled by the chroniclers of our age). So among the vast multitude of facts, only a very small selection is available to us, reported to us by biased, fallible, human chroniclers.But even this narrow selection of facts is too much for the historian. Many of these fact are not historically significant and the historian needs to further filter them down. How does a fact become historic? “Facts are like sacks”, quotes Carr. The historian picks out a particular fact and declares it historic. If other historians follow his thinking, the fact becomes part of our collective memory and national history, at least for a little while. The colour of the glasses that the historian wears determines the facts he selects.Beyond facts, we’re all taught that causes and consequences make up the essence of history. In high school, many of us had to reproduce an obligatory number of causes for either WWI or II which were then graded according to a predefined list. The fallacy of this thinking lies in the assumption that the number of causes is finite. As with facts, the historian equally needs to select among a quasi infinite number of causes.Now all these facts and causes need to be cast into a narrative using the mold in the historian’s mind. This should be an interactive process with reading and writing as simultaneous processes. As writing progresses, the selection of facts and causes gradually becomes more focused.Is there then such a thing as an objective history, or is it all in the historian’s mind? Every history by a historian contains an autobiographical element. The historian needs to maintain a fine balance between facts and interpretation. Too much facts and you’re basically writing a calendar of events, too much interpretation and you’re writing propaganda.As an aside, one of the gems in this book is that it comes with priceless examples from daily life to illustrate various historical perspectives. No spoilers here – find out for yourself (for example on p123-124 of this edition - very funny, but hardly reproducible).Finally, history is progress, says Carr. It is not theology nor is it literature. Historic progress is based on a clear sense where we come from and where we are going. This direction can change which makes the past evolve with the present. Progress need not be linear, as was amply demonstrated in last century. At the time of writing his book, Carr recognised history’s development towards the concept of freedom. Let us sincerely hope we are still on that path and interpret history accordingly. The book full of knowledge (as a IB, TOK and history teacher - these book is a revelation).I did study history, but I have never been thinking about its core - philosophical problems as this book deals with and analyses. I am very grateful that Mr E.H. Carr allowed me to enter "this historical universe". The chapters give you hint about the issues:1. The historian and his facts - deals with personality of a historian (backgrounds - historical, territorial/national and then "problems") and what is a historical fact (what is it, how do they work with them, what does it mean...),2. Society and individual - these two aspects playing role in historical creation (what do we "want" to study in history and why),3. History, Science and Morality (similarities between History and Science, to what extent a historian can make a moral claims - judgments),4. Causation in History,5. The Widening Horizon - problematic questions in history (and its future),6. the last part is written by Mr R.W. Davies who presents Carr´s plans to add another aspects to his "next and unborn" book + revisions based on his observation of human development. Oh, how people are completely unaware what history means and what a historical work means too! How many times I have heard that history is biased by "winners", that historians are mere political tools and that history is not a science at all, that it cannot know anything. How to tell them that they are absolutely wrong for they do not know what a history is. However, the fact is, that if one wants to discuss this issue with a non-historian, it will be fatiguing as the one will have to explain all nuances laymen do not know... People should be more interested in methodology of different fields, if they want to speak about them - at serious levels. If not, they just and only use empty words and phrases (illustration: you speak about how to build a dam, but you do not know anything about engineering and construction).I am happy that I read it, I feel how I use his ideas to challenge mine - and my ideas when I speak to my students about history or TOK. Message for me: Paul buy this book! Excellent introduction to the methods, theories, and history of history. English students study lit theory, shouldn't history students study history theory? The first 3/4 of the book was really, really good. The last 1/4 was a bit muddled and sometimes seems contradictory--I think a product of the author attempting to have a worldview of progress and rationality without any real basis for the existence of rationality or what makes a development for the better. The book was kinda dense and slow to get through, but I enjoyed it over all. I didn't always agree with him--partly because this book is getting a little aged, partly because he makes some ridiculous statements about religion and the practice of history. Some of his concerns in the how history was taught or conceptualized have been/are being rectified in most universities--and over-corrected in others. Overall, I'd recommend to anyone with a serious interest in history. A seminal text in historiography. Although written (from a lecture series) in 1961, many of the assertions stand. Particularly pertinent at a time when collective and public memory is being examined and reflections on how the public remember what and why; such as the contention of memorials. Interesting reflections on the relationship between history and progress, what it is to study history - the depths required, and the relationship history has with other disciplines. The distinction between historical facts, truth and general facts make a good grounding for students of history and I only wish my own university had directed me to this text, rather than another at the end of my undergrad. a stimulating tour through most of the major questions of historiography, given by an establishment radical of the olde school. while i do not agree with all of Carr's conclusions, especially when it comes to the idea of Progress, his brilliance shines through in every page. he writes sensibly and clearly and concisely, a refreshing contrast to the jargon filled tomes of many who speculate on historical ideas that seem abstract but are really concrete. recommended to anyone interested in history.